Even when a motorcycle accident isn’t fatal, it can still be catastrophic and devastating. As the injured victim of another person’s negligence, you may be entitled to reimbursement for your medical treatment and lost wages, but motorcycle accident victims often face additional challenges when pursuing a personal injury claim. You’ll need to have a good personal injury lawyer fighting for your rights. Orange County motorcycle accident lawyer Chris Purcell is that lawyer. For more than twenty years, Chris has been defending the rights of motorcycle crash victims in Irvine, Santa Ana, Anaheim, and throughout Orange County. Chris fights aggressively for every cent of compensation that his clients need and for the justice they deserve. WHY DO YOU NEED A LAWYER IF YOU WERE INVOLVED IN A MOTORCYCLE ACCIDENT? Motorcycle accidents, because they typically leave less debris and evidence than car accidents, are usually more difficult to reconstruct. Witnesses don’t remember everything, and what they do remember, they quickly begin to forget. Police reports may be incomplete or entirely inaccurate. Chris Purcell knows that motorcycle accidents are different, so Purcell Law uses whatever resources are necessary to determine what really happened. In serious accidents, Chris will have an accident reconstruction investigator analyze the accident site, the damages to your bike and other vehicles, and other information to determine the precise cause of your accident and injury. Attorney Chris Purcell has substantial experience handling motorcycle accident cases involving traumatic brain and spinal cord injuries, broken bones, fractures, and internal injuries. He will work with your physician and other specialists to determine your medical and rehabilitation needs, and he will aggressively pursue the resources you’ll need to pay for the medical bills you’ll have after a serious motorcycle injury. WHAT ARE THE CAUSES OF MOTORCYCLE ACCIDENTS ACCORDING TO ORANGE COUNTY ATTORNEYS? The most common type of motorcycle accident involves a motorcycle colliding with a motor vehicle. Because the motorcyclist does not have as much protection as the driver of a motor vehicle, he or she may suffer much more serious injuries than the driver, even if the driver was at fault. If you or a loved one has been injured in a motorcycle accident, seek legal representation from attorney Chris Purcell. You may be able to recover damages for your injuries from the at-fault party’s insurance company, but first, you have to make the call to discuss your legal options. Motorcycle accidents can cause serious head injuries, especially if the driver was not wearing a helmet. Head injuries are the most common injuries that result from a motorcycle accident, and many of them are fatal. Besides head injuries, you may also suffer from road rash, which occurs when you slide across the pavement after a collision. Road rash can occur even when you are covered by layers of clothing. 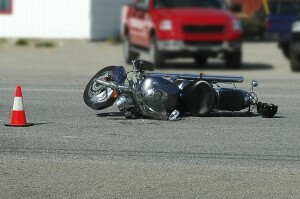 Lower body injuries are often common in motorcycle accidents. Bones in the knees, legs or feet may be broken, fractured or completely shattered upon impact. Protective clothing can often limit this type of damage, but it is never a guarantee. Regardless of the type of injury, if it was caused because of someone else’s negligence, you may be entitled to compensation, but you will need help from one of the top Orange County personal injury lawyers. Speak with Chris Purcell at once to discuss your legal options. Motorcycle accidents are sometimes out of the control of the motorcyclist, but they can often be prevented. Motorcyclists should always wear protective gear, including helmets, full-fingered gloves, long pants and boots. California has a universal helmet law, meaning motorcyclists are required to wear helmets at all times while operating a motorcycle. Helmets greatly reduce the risk of serious injuries and death, yet many motorcyclists still choose not to wear them. Make sure the clothing you wear fits close to your body so it does not fly loose in the wind and distract you or block your view. Motorcyclists should also maintain their bikes to ensure they are riding in safe conditions at all time. Check your tires, lights and turning signals so you can ensure other drivers will see you on the road. Of course, no driver should ever operate a motorcycle or other vehicle under the influence of drugs and alcohol. Drivers should also reduce distractions such as smartphones, music or other riders. This will help you focus on the road and look out for hazards that may be in your path. Remember to be aware of your skill level as you travel on your motorcycle. Motorcyclists can also get into accidents when they overestimate their ability on the road and try a dangerous stunt that leads to injuries. Like every other driver, motorcyclists should obey the rules of the road. Follow all speed limits and other posted stop, merge and yield traffic signs. The more cautious you are as a driver, the less likely it is that you will get into an accident, even if other drivers on the road aren’t as careful. But even if you follow all of these safety tips, you may still get into a motorcycle accident. If this happens to you and you suffer injuries as a result of someone else’s negligence, don’t hesitate to contact attorney Chris Purcell to discuss the next steps in the legal process. Chris Purcell is committed to helping you get your life back after a serious motorcycle injury and helping you move forward in the most constructive way possible. Chris represents clients throughout Orange County from Yorba Linda to Huntington Beach to Dana Point. He has experience representing clients in personal injury law cases involving motorcycle accidents, dog bites, slip and fall accidents, pedestrian accidents, bicycle accidents, premises liability, and defective products. All personal injury claims are handled on a contingency fee basis, so you pay no fees unless and until Purcell Law recovers compensation for you. To schedule a free consultation with an Orange County motorcycle accident attorney, call 714-884-3006 or contact Chris by email today.